An explosion and fire blew a gaping hole in Flight D3159, travelling from Somalia to Djibouti with 74 passengers , on Tuesday 02/02/2016, at about 14,000 feet, forcing it to make an emergency landing at Mogadishu’s international airport, officials and witnesses said. An eyewitness said an elderly man caught fire before he was sucked from his seat and out of the Airbus A321. The man who fell from jet was later named as named as Abdullahi Abdisalam Borleh, 55, from Somaliland, the Northern autonomous province of Somalia . The pilot said he thinks it was a bomb. An aviation expert who looked at photographs of the hole in the fuselage said the damage was consistent with an explosive device. Two people were slightly injured as 74 passengers and crew of the plane were evacuated after the plane made a safe landing on Tuesday, Somali aviation official Ali Mohamoud said. It was not certain if all the passengers were accounted for. However, there were unverified reports that a person fell out of the hole caused by the explosion. Mohamed Hassan, a police officer in nearby Balad town, said residents had found the dead body of an old man in a wheelchair who might have fallen from a plane. 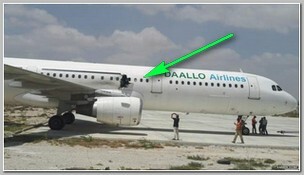 The flight operated by Daallo Airlines a, was forced to land minutes after taking off from the Mogadishu airport. Two unnamed U.S. government sources said they believe a bomb caused the blast explosion – Somali investigators said, on Thursday 02/04/2016, the man in the wheelchair was a suicide bomber who failed to detonate properly his device and was the only casualty in the attack. Investigators have said. on Friday 02/06/2016, Abdullahi Abdisalam Borleh, the ‘Weelchair bomber’ may have smuggled a bomb on board the plane in his wheelchair before moving to a different seat once on board, a Western diplomat briefed on the investigation told the Wall Street Journal. They also believe Somali based terror group al-Shabab was behind the suspected bomb blast. Somali government officials said, on Saturday 02/06/2016, airport security cameras caught two people dressed in military uniforms passing a laptop to the suspected passenger Abdullahi Abdisalam Borleh. An official of the Somali Intelligence Agency told VOA news agency earlier that Mogadishu airport staff and employees of Daallo Airlines were among those who have been detained for questioning, including two people suspected of assisting the suspected bomber. The case reminds the failed attempt of Umar Abdulmutallab. the ‘Underwear bomber’ of Flight-253 in Christmas 2008 eve or the case of Richard Reid, the ‘Shoe bomber’ in 12/2001. « TOP ISIS IN YEMEN, JALAL BALEEDI, KILLED.